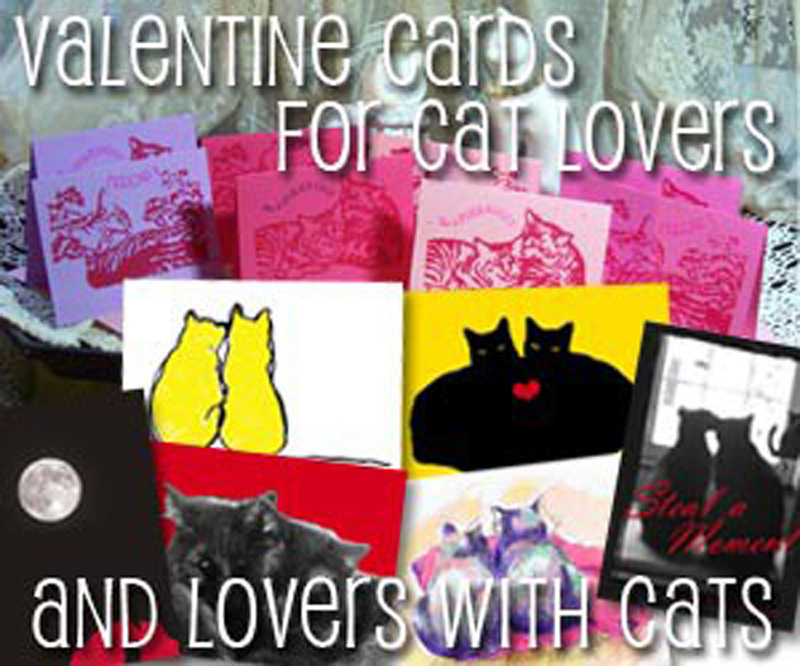 All sorts of feline-inspired valentines! Have we come around to Valentine’s Day already? 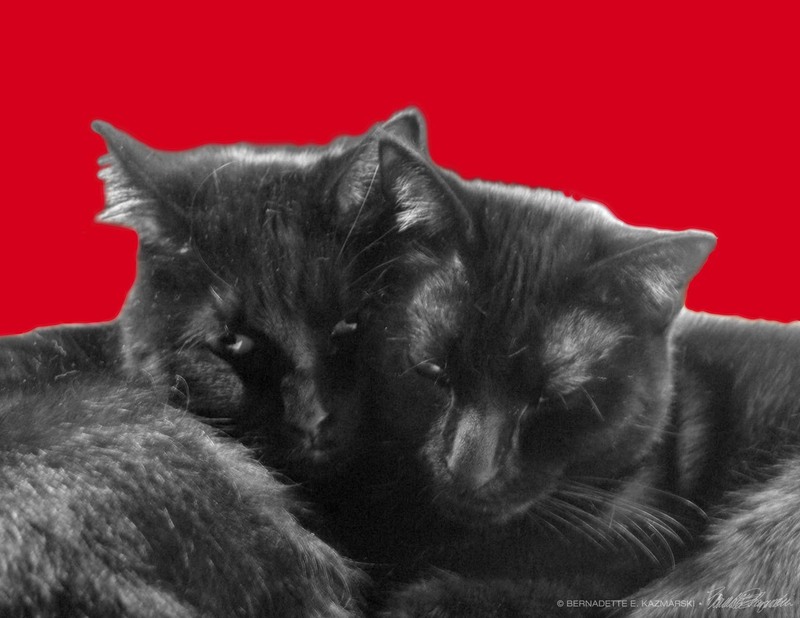 I have a ready supply of feline Valentine images with all the cuddling that happens around here. 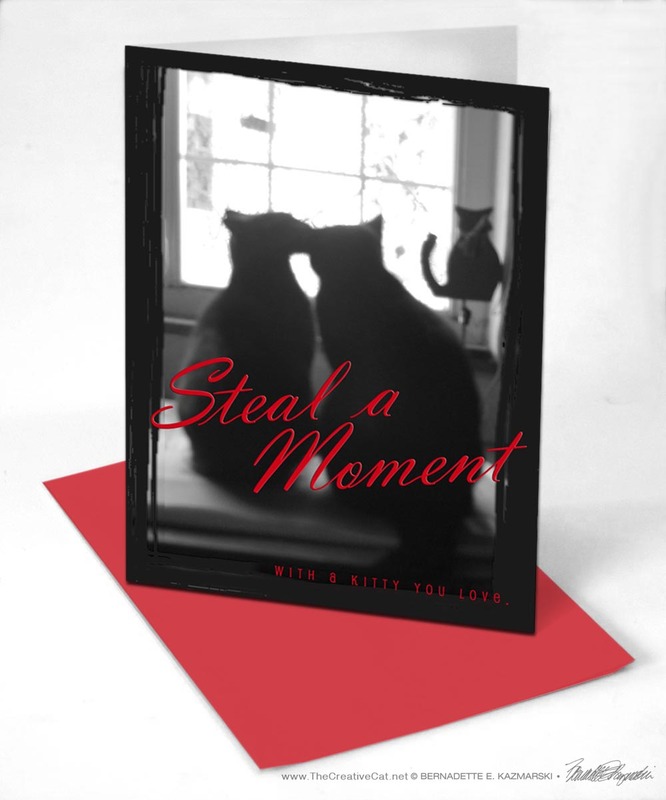 In this post I feature all my commercially printed Valentines with photos and illustrations, seven designs in total. 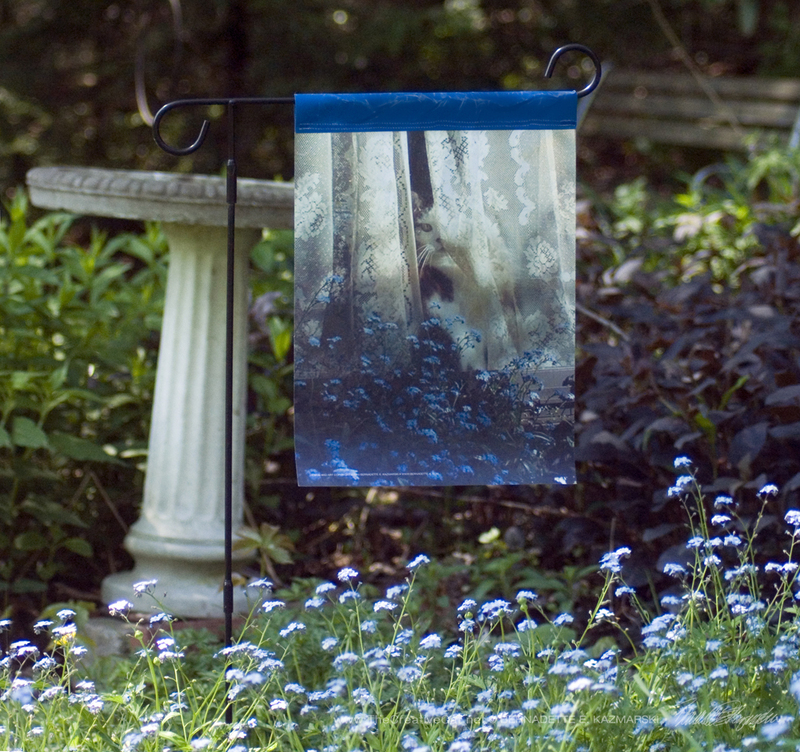 These cards are 5″ x 7″ and are printed on 12 pt. gloss cover, uncoated inside, and nearly all have a message inside. 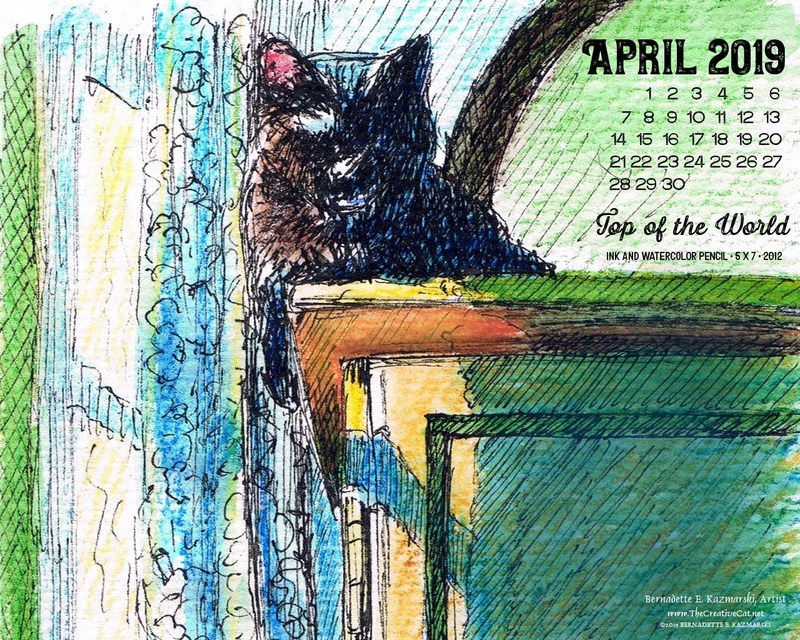 Orders of a half dozen or more are packed in a clear-top vinyl greeting card box. 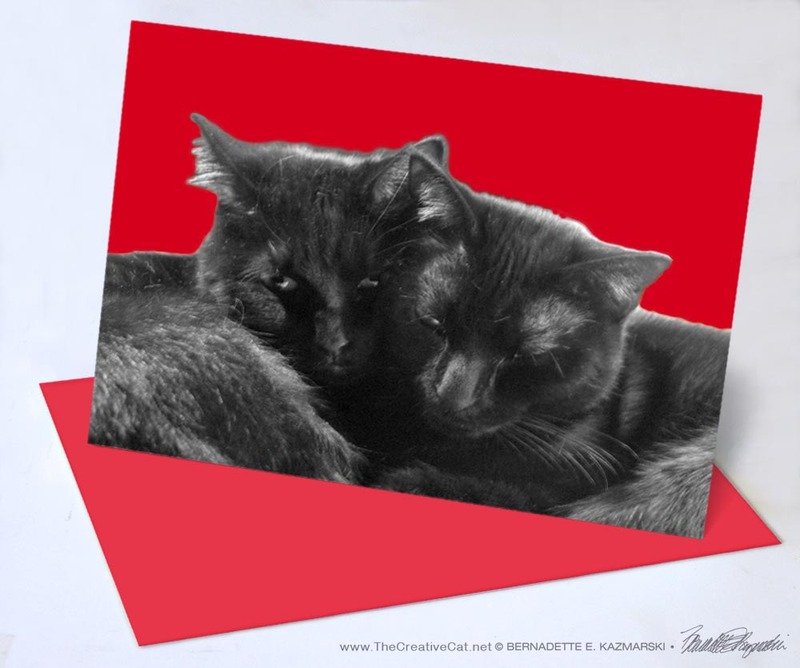 While they are clearly useful for Valentine’s Day with all that red and loving purrs, you can also use them for all-purpose greeting cards, sympathy, thinking of you, friendship, or find some frames for 5″ x 7″ images and frame them for your walls. 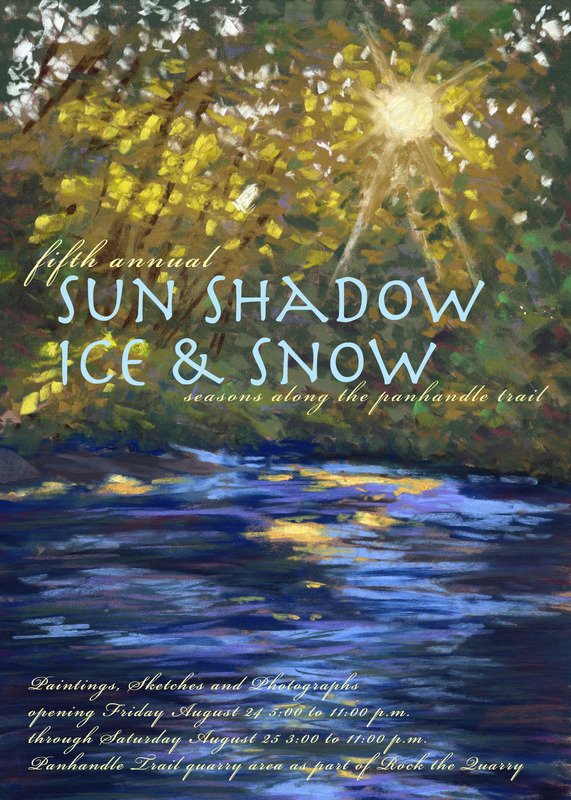 Cards are available in custom quantities or sets. 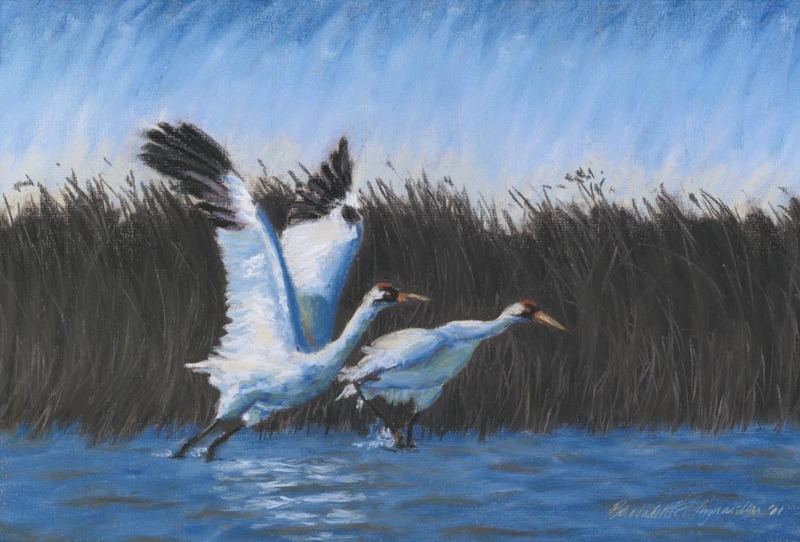 Cards are available individually in separate listings. Each card has a message inside, as shown below. Choice of red or white envelope, or a mix of both. 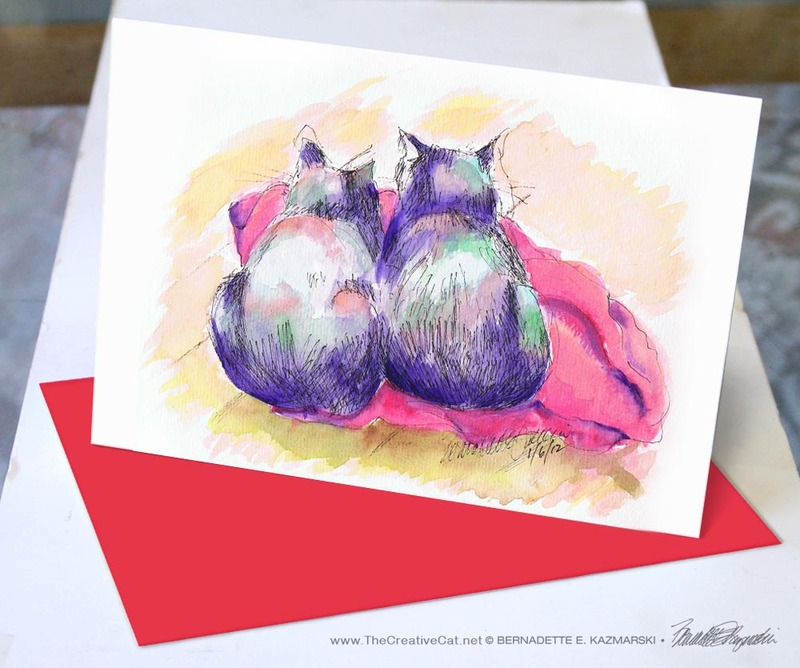 This card was designed from one of my daily sketches and just lends itself to a variety of themes—Valentine, friendship, thinking of you…I introduced it for Valentine’s Day but actually offer it in two designs. You may just be friends with the recipient, or you may be using the card for an entirely different purpose, so I offer this design with a heart, and without. 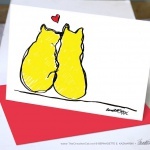 Two Yellow Cats everyday card. 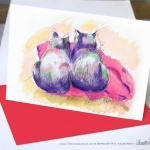 The message inside is “…purrrr….purrrrr…purrrrr…” in my own handwriting in an attempt to simulate the kitty purring on my lap at the time, a message that can be given to a friend or to someone who is a little more than a friend. 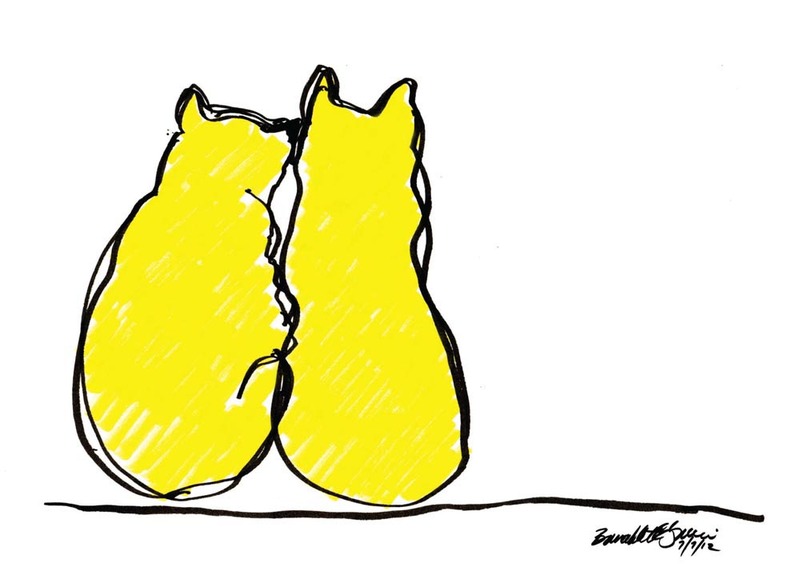 Text inside “Two Yellow Cats”, both design versions. 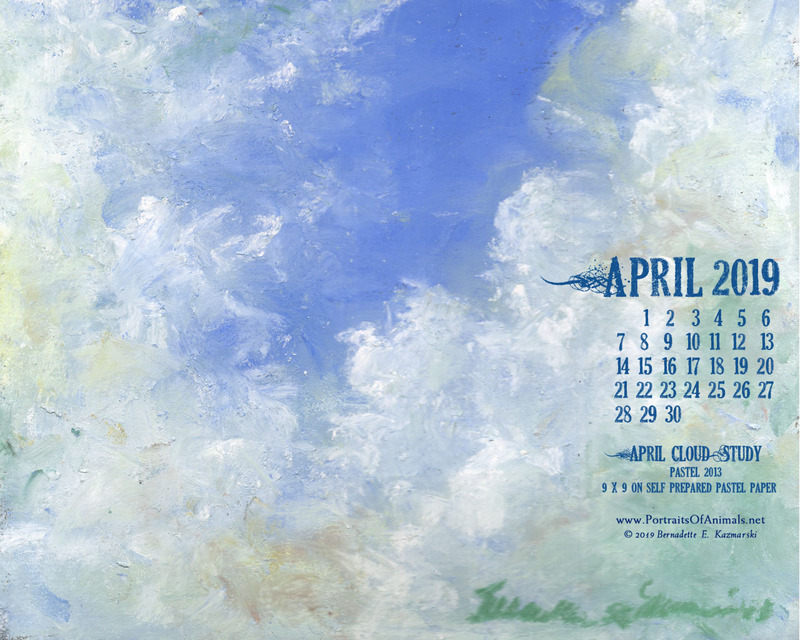 Both design options are available all the time so you can send your chosen greeting any time of the year. 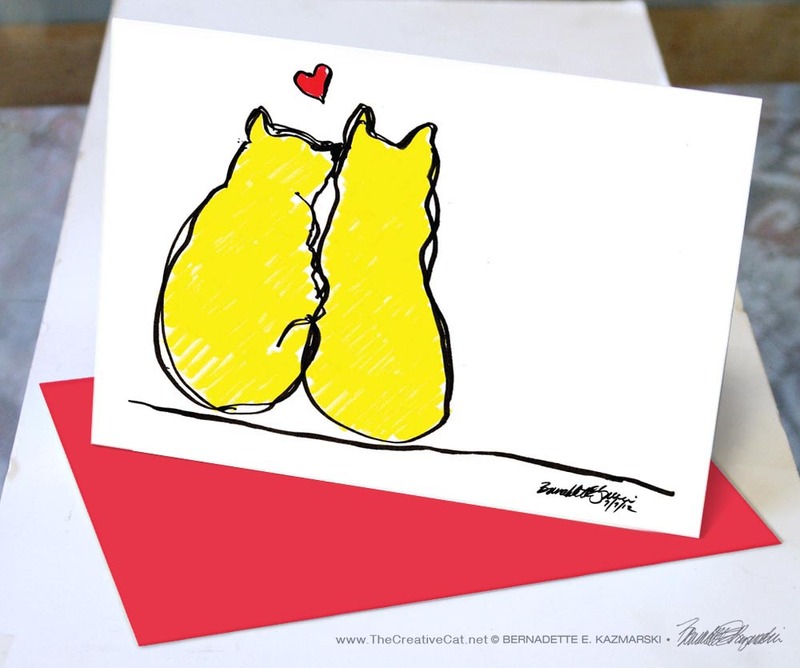 This card comes with choice of red, white or yellow acid-free envelopes which are inkjet/laser compatible. This daily sketch was done in felt-tip brush markers, signed and dated 7/7/12. That’s Jelly Bean and Mewsette enjoying a quiet moment looking out the basement door. Actually, Jelly Bean was trying to get Mewsette to give him a little bath on the head, knowing that if he leaned in at just the right angle and just the right moment, Mewsette would turn and lick him without even thinking about it. It didn’t work, but it was okay. Jelly Bean and Mewsette are black but as you know I have fun sketching them in totally unrealistic colors. In this case I wanted to express the sunshine on a hot summer morning. After I’d looked at it a few times I could just imagine a little red heart above the two so I drew that separately, but in the same style. Nuzzles and Purrrrrs for Valentine’s Day! The operatically romantic Giuseppe Basil Verdi and the French-Canadian belle femme Mlle. 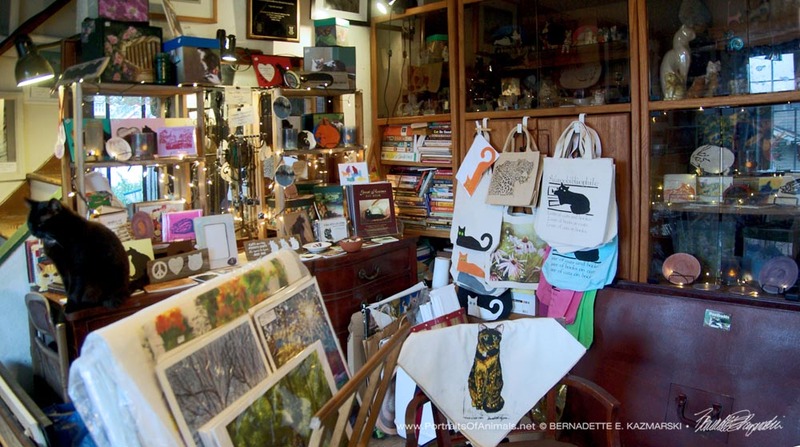 Daisy Emerald Marguerite have been carrying on a long-distance affaire since the summer of 2011; they always conclude their correspondence with “nuzzles and purrrrrs”, hence the name and the text inside. The inspiration for this card. 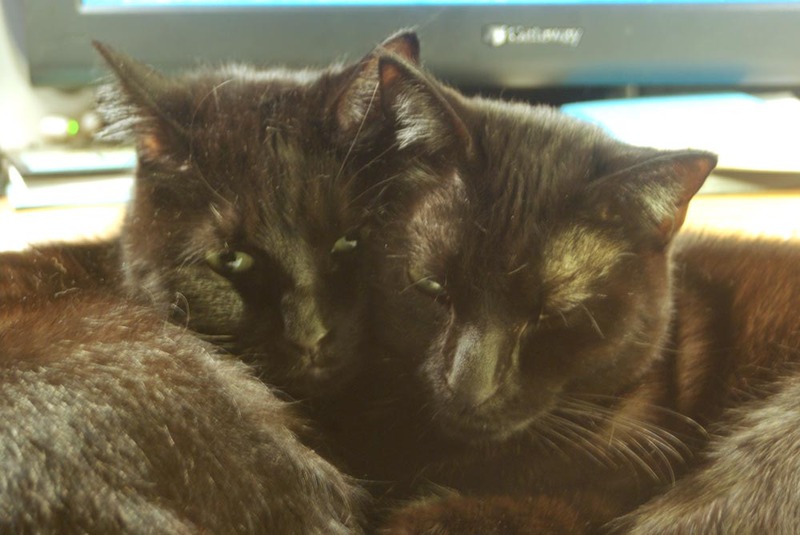 I photographed Mewsette and Giuseppe cuddling on my desk while I worked at my computer and posted them as a daily photo. 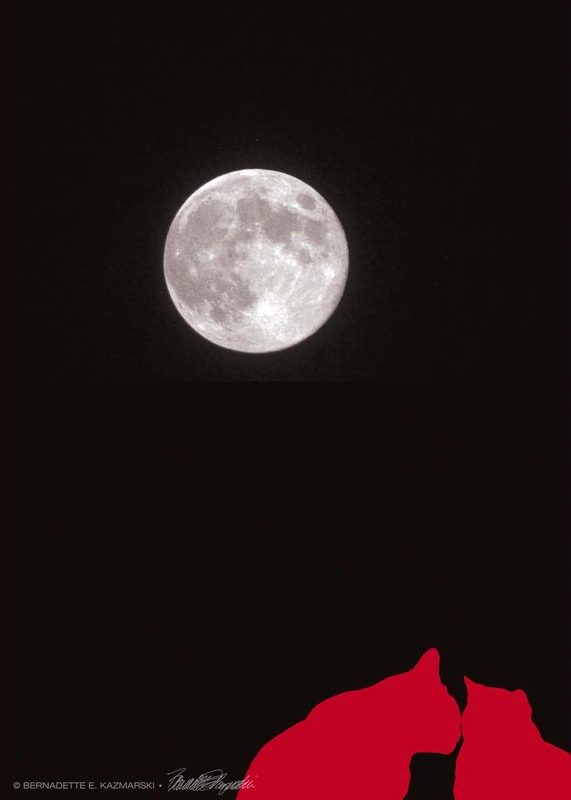 So many readers immediately said “Valentine” that I thought I’d oblige with a design! And even though it’s Mewsette and not Mlle. Daisy, Mewsette looks so much like the lovely and dignified Mlle. that she is a stand-in when needed, and always knows when her brother needs a hug. Text inside “Nuzzles and Purrs”. 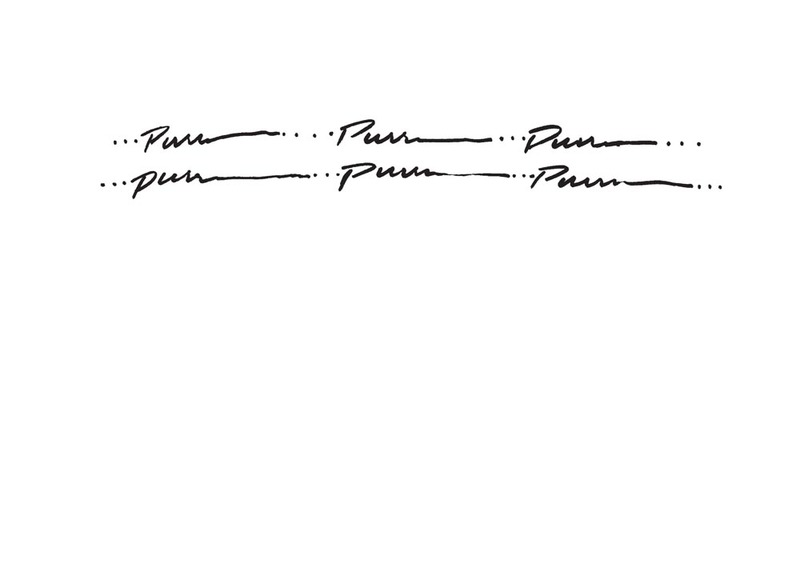 The message inside is “NUZZLES AND PURRRRRS” in a really fun font. 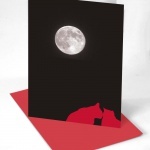 Card comes with choice of red or white acid-free envelopes which are inkjet/laser compatible. 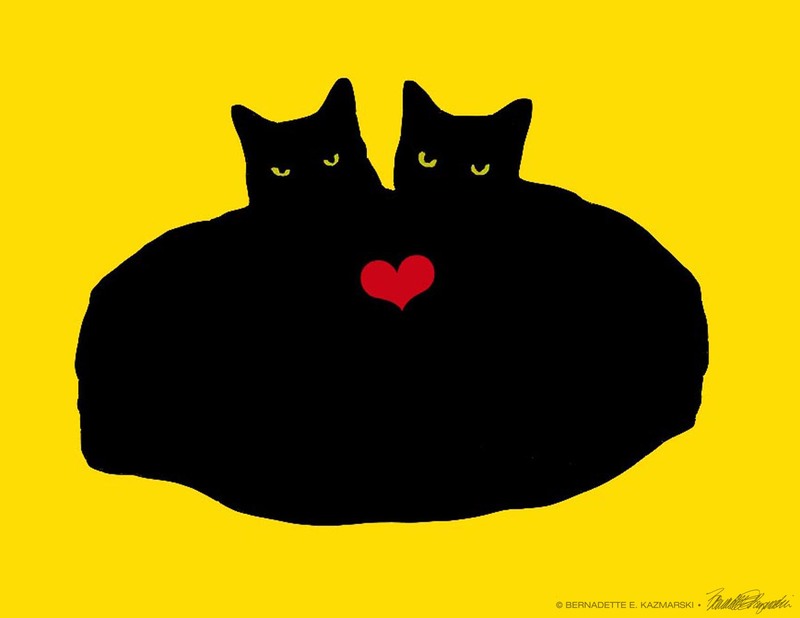 “Heart Cats”, featuring Mr. Sunshine and Mewsette. This card is possibly the most popular of them all. 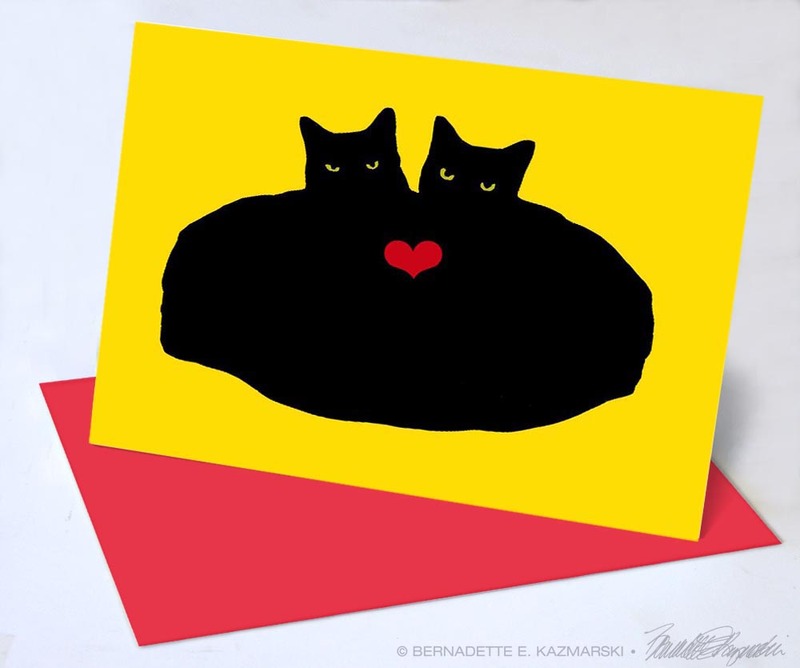 The siblings of the Fantastic Four often cuddle and hug, cheek to cheek, but this design, adapted from the original heart-shaped cats photo of Mr. Sunshine and Mewsette is still my favorite; the background color of the card is adapted from the color of their eyes. I photographed these two in the bathroom at night in poor light, but no matter, such a sweet photo, I’d do my best. Since then I’ve adapted the two into many different designs and colors. 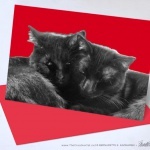 Here, for Valentine’s day, they are solid black with the solid cerise of their eyes, and just one red heart as they hug. The message inside is “YOU ARE MY HEART CAT” in a really fun font. Card comes with choice of red or white acid-free envelopes—I just can’t match that background color, so no yellow—which are inkjet/laser compatible. 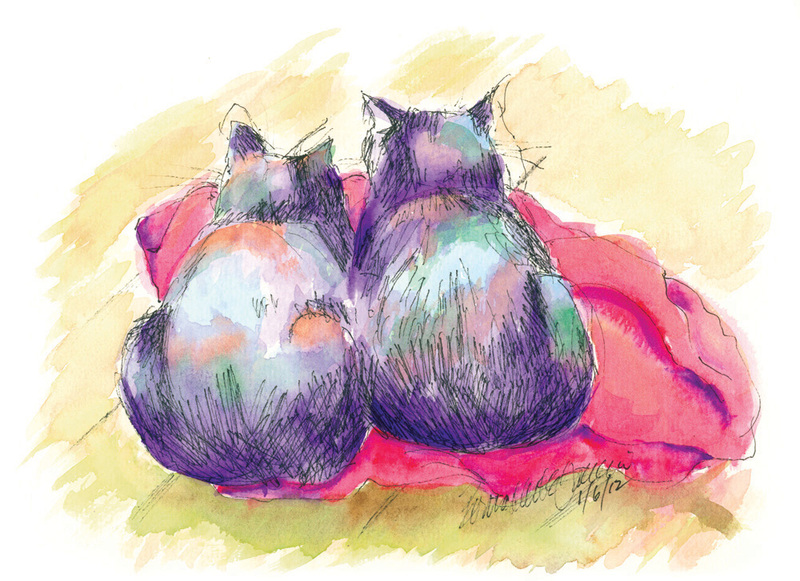 This daily sketch was done in felt-tip ink technical drawing pen with watercolor washes, signed and dated 1/6/12, and pictures Jelly Bean and Mewsette using a red blanket I’d tossed to the landing for the laundry as a comfy impromptu cat bed. 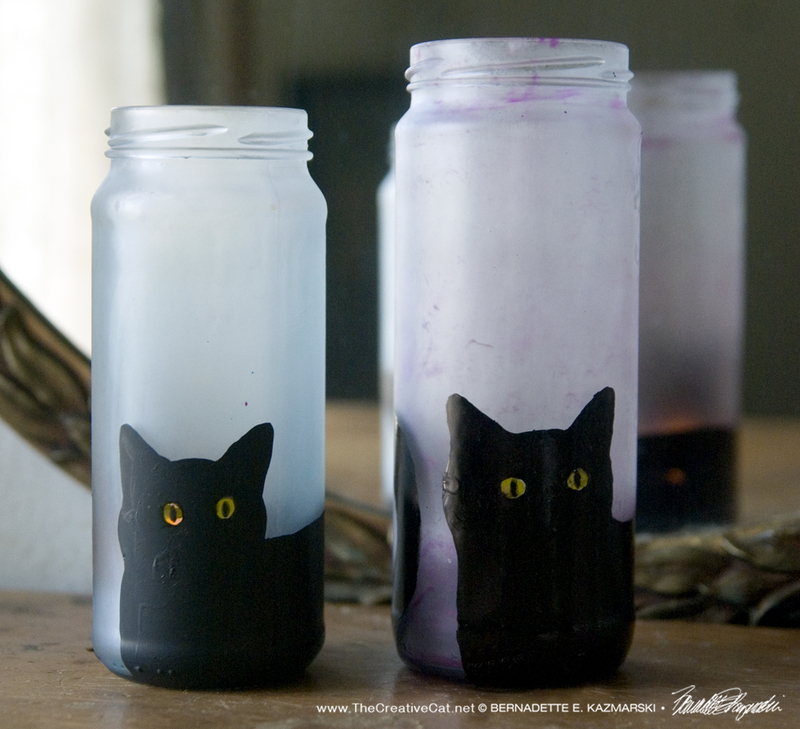 Black cats, like white cats, have all sorts of colors in their fur, and in the day’s filtered sunlight their fur glistened with all sorts of highlights and shadows. The randomly shaped and wrinkled red blanket heightened the range of colors in their fur and even the neutral wood floor held random combinations in its old unfinished grain. Mostly, the composition was what attracted me in the first place: two similar heavy rounded shapes, the random soft shape and the smooth shape brought elements together in a very pleasing way. 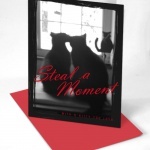 The message inside is “Purr Hearts” in my handwriting and hand-drawn heart-pawprints. 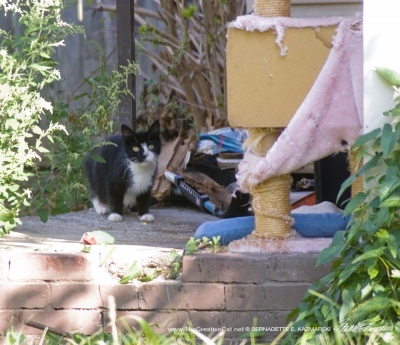 This photo was originally an unfocused mistake but I liked it better than the focused version, and so did many readers of The Creative Cat. The message inside is “HAPPY VALENTINE’S DAY”—imagine that! 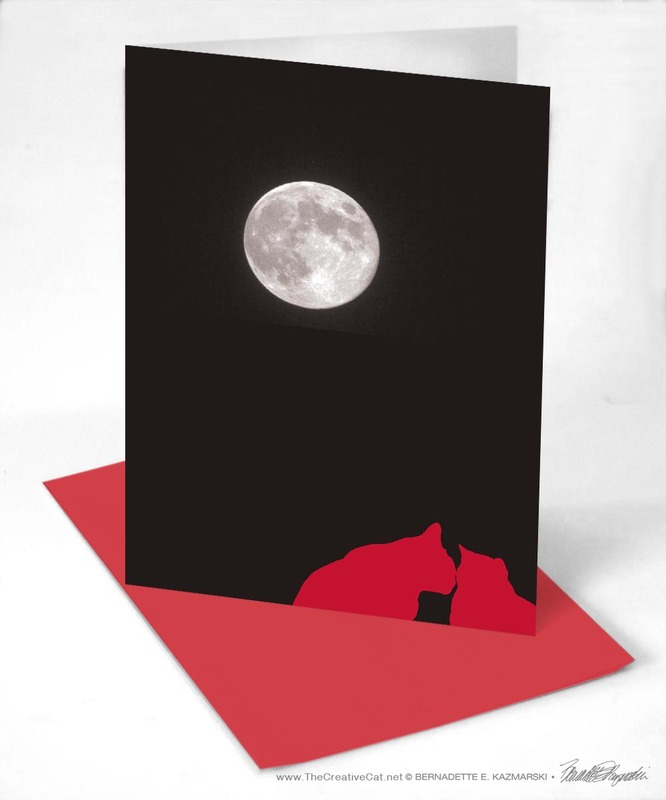 Card comes with choice of red or white acid-free envelopes which are inkjet/laser compatible. I originated this design as a Halloween card using autumn shades in October 2011, but with a little color change it suits Valentine’s Day. 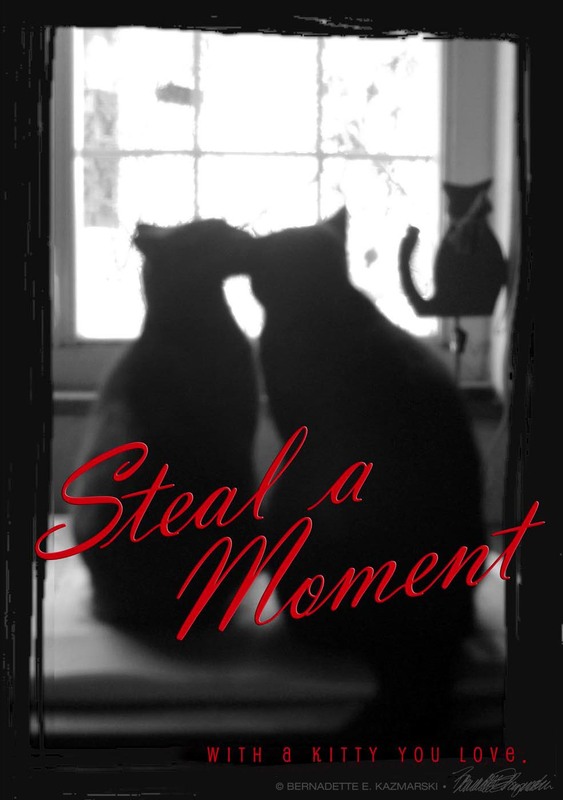 It features my photograph of the full Harvest Moon and the silhouettes of Jelly Bean and Mimi derived from a photo of the two. Unlike all the others, this card is blank inside, ready for your message. Emeraude came to me as an emaciated 19-year-old foster cat along with her 20-year-old fur brother. they didn’t have much time with me but each of them and I made the most of every minute. 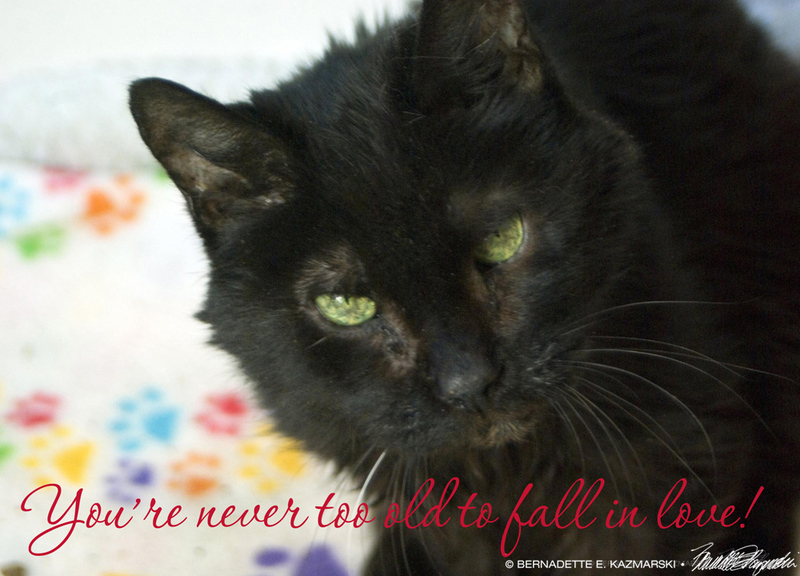 Never hesitate to adopt an older pet! You’re never too old to fall in love! I’ve included this card in my Valentine post because, well, it’s all about love, isn’t it? When I sat down to design a sympathy card in the name of Emeraude , this idea kept coming back to me so I actually designed it first. Is this what Emeraude would say? I’m sure, and it’s likely what a lot of other senior kitties looking for a home would say as well. And it makes me smile. It’s a great sentiment to encourage the adoption of senior pets, and it might even come in handy for a few humans as well. This card is blank inside, ready for your message. If no choice is made, the default envelope color is red. 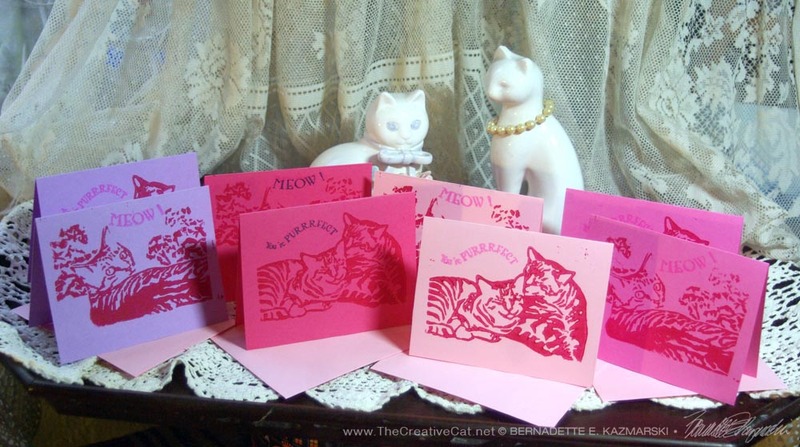 You can also find these cards and many more featuring felines and non-feline subjects under Greeting Cards in the main menu. 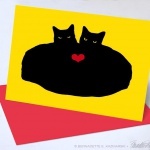 This entry was posted in black cats, greeting cards and tagged black cats, cat artwork, cat photos, feline valentine cards, valentine cards on January 20, 2017 by Bernadette.